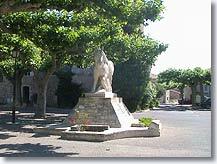 Departement of the Bouches du Rhone - Alpilles - Population : 2.584 inh. 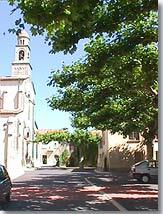 9 km West of Cavaillon and 12 km east of Saint Rémy de Provence. 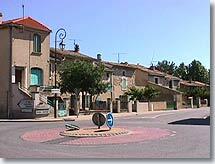 Mollèges is a charming little village sitting peacefully in the heart of beautiful Provence in the Alpilles between Cavaillon and St Rémy. 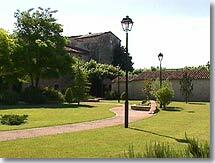 To reach Mollèges you'll take a pretty little road (the D24 froms Verquières) which winds through magnificent countryside alternating between orchards, avenues of cypress trees and plane trees. You'll cross verdant little plains offering broad panoramas and you'll no doubt want to drive slowly to appreciate the splendours before you ... fine Provençal country houses, lovely groves of fruit trees, poppies and wild flowers growing on the verges, and a pure blue sky with of course the Alpilles hills as a backdrop ... you'll arrive at the village still dazzled by these wonderful landscapes worthy of the finest postcards. 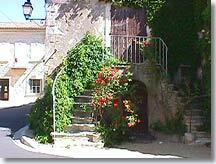 Once you arrive in Mollèges, you'll discover a village full of charm and character. The little narrow streets criss cross past ancient houses, with old wooden doors, windows with flower boxes, and coloured shutters faded by the sun. 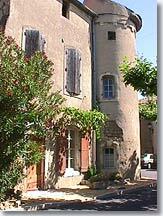 As you walk along, you'll discover some fine houses, some of which have small gardens that must be a real delight. Then you'll come to a small delicously shady square next to the church, surrounded by harmoniously proportioned stone-built houses..
As you go round the church, you'll notice a large old house that has been tastefully restored and refurbished, and you'll be pleasantly surprised to discover the gardens that surround the church and the nearby mairie with their vast flowerbeds and spotless lawns !. Everything is quiet and peaceful. Everybody knows each other, and the locals always have a smile on their faces. You can hear the children in the school playground, while their parents are at work in St Rémy, Cavaillon, Châteaurenard, Orgon or Salon. During the day you'll meet the people who don't work, who are retired. The women talk amongst themselves while a cat rubs against their legs. As for the men, they sit on a shady bench and watch the rare passersby. Remains of the Cistercian abbey. Wednesday morning market (Le Cours). Separate entrance and private terrace with garden furnitures. Kitchen available with microwave, fridge, freezer. Saint Andiol (4 km), Plan d'Orgon (4 km), Verquières (5 km), Eygalières (6 km), Orgon (8 km) and Saint Rémy de Provence (12 km).